IAAF/AL-Bank World Half Marathon Championships - Copenhagen 2014, which will be held on Saturday March 29th, will be a 21,097.5 metre-long running festival in the heart of the Danish capital. Copenhagen has staged several sports events in the very heart of the city such as the UCI Road World Championships 2011, the World Cup Final in Archery and the IOC Session and Olympic Congress. Copenhagen has a harbour clean enough to swim in and provides a historical oasis that is constantly embracing the future – also when it comes to staging sports events. The course is flat and completely free of traffic. Located in the centre of Copenhagen, the surface is asphalt and the width varies from 3 to 20 meters. The course leads the runners through the inner Copenhagen with a digression to uptown Frederiksberg. Starting in front of the Danish Parliament at Christiansborg Castle, the runners will pass famous sites, scenic areas, canals and parks. 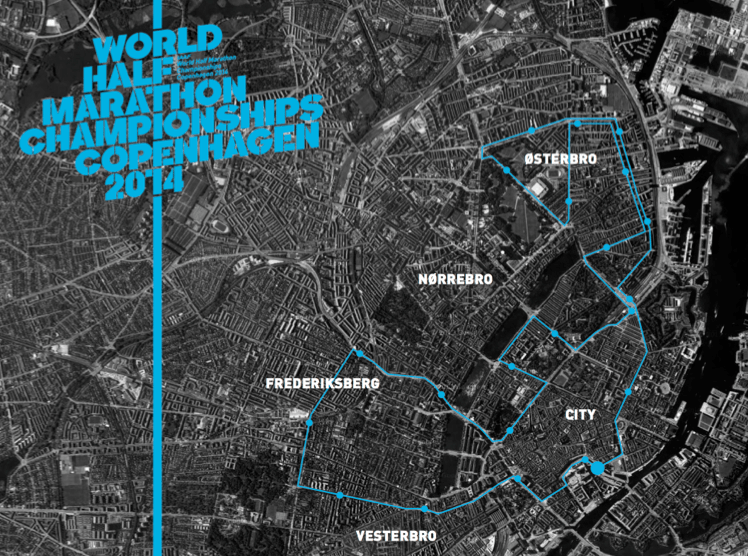 Going uptown to Frederiksberg, the athletes enter the steepest part of the course with a top altitude of 14 meters. Indeed a flat course. As they pass the Frederiksberg Town Hall they turn left onto the beautiful Frederiksberg Avenue lined with flags alongside the entire 900 meters avenue leading the athletes back to the heart of Copenhagen. Soon after, the runners enter the final 2 kilometres where they will first pass the Tivoli Gardens and Copenhagen Town Square before passing the Danish National Museum only to enter the finishing area right in front of Christiansborg Castle.